Who said family movie nights had to be on the weekends? 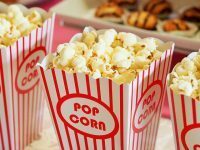 If you’re willing to switch your movie nights to a weekday, then you’re set to save some money on your family outing. Now on Tuesdays, you and your family can enjoy $5 Movie tickets* at participating AMC Theatres. Carmike Movie Theatres is now apart of the AMC family. To purchase your $5 movie ticket, you need to be apart of AMC’s rewards program and it’s free and easy to sign up online or at the movie theatres. Once you’ve signed up, head on over to the box office on a Tuesday and purchase your $5 movie tickets. The best part? This movie deal is valid the entire day. Make it a family date night and pay a fraction of the regular price. Additional fees apply to IMAX, 3D, BigD, and others. This is such an amazing deal, but it’s only available at participating locations only. The locations listed below are located in the Tampa Bay area. Please call ahead to make sure that they are participating in this deal. This movie deal is subject to change.